Time for our first annual Mid-Season team and you can already see some shakeups from our preseason team, most notably Jake Locker getting cut from the team. Locker’s numbers would probably look better if Jermaine Kearse didn’t lead the Pac in drops with 9, but you take the good with the bad and he’s been productive when he holds onto the ball. The tight ends in the conference haven’t been used as much as they have in the past, but Coby Feleener of Stanford has been consistent catching the ball and solid in run blocking. Perhaps the biggest surprise on the first team defense is the freshman Justin Washington making the team. He benefits from playing alongside two of the best defensive ends with Brooks Reed and Ricky Elmore, but he’s taken advantage of his opportunities. Mason Foster will lead the conference in tackles this year, because the Husky defense will struggle to get off the field, but Akeem Ayers plays a bigger role in the success of UCLA. Sophomore Cliff Harris of the Oregon Ducks leads the conference with 4 interceptions and has a couple punt returns for touchdown this year so he makes the list as a corner back and punt returner. For the 2nd team, Matt Barkley got the nod over Nick Foles. Barkley has been impressive in his last few games and absolutely torched a solid Cal defense yesterday. Leaving JacQuizz Rodgers off the list might surprise some people, but he just hasn’t produced like the team needs him to. Part of the problem is the offensive line and combined with an inconsistent passing game, opposing defenses can stack the box. Robert Woods makes the list over his teammate Ronald Johnson and he’s quickly becoming one of the top wide receivers of the conference. At the midway point of the season we can now see that 9 teams will be competitive in the conference this season. Although Washington State is making great strides, they’re still a year away from winning a couple games in conference play. According to Chinese Zodiac week six is the week of the quarterback and based on the performances this week that holds true. Ryan Katz (KATZ) had his coming out party by torching the Arizona defense with the long-ball and an accurate, strong-armed, intermediate passing game. The Beaver quarterback finished the day with 22 completions on 31 passes for 393 yards, two touchdowns and an interception. We thought that Katz would struggle after James Rodgers (JROD) went out with an injury, but he didn’t miss a beat. Every year Oregon State gets blown off the line of the race to the championship, but Mike Riley is a long-strider that picks up his pace in conference play. The top three quarterbacks of the NASPAQ all had big days. Nick Foles (FOLE) threw 35 of 46 for 440 yards with 3 touchdowns, one interception. In Palo Alto Stanford’s Andrew Luck (Luck) (20-24, 285 yards, 3TD’s) and USC’s Matt Barkley (BARK) (28-45, 390 yards, 3TD’s) saw two of the worst secondaries in the country and capitalized on their opportunities. This game felt like the last team with the ball would win the game, and for the second straight week USC went down to a game winning field goal. If you’re a fan of big time passing games, then the other Bay Area game between UCLA and Cal would have put you to sleep. Kevin Riley (RILE) just hasn’t made the improvements he needed to this season and Kevin Prince (PRNC) has a lot under achieving potential at wide receiver. With all the great performances we saw at quarterback this week one would expect the running back numbers to drop, but the top three guys keep on going over the 100 yard mark. It should be noted that no roster has both a top three quarterback and running back on their roster. LaMichael James (LMJ) continues to set the pace each week and playing Washington State was another opportunity for him to climb on the Heisman ballots. James had 142 yards and 2 TD’s on 25 carries and added an 84 yard touchdown reception on a wheel roue where he blew right by the defending linebacker. Shane Vereen (VERE) had almost identical rushing numbers with 25 rushes for 151 yards and 2 TD’s against the Bruins. A surprisingly poor performance came from USC’s tandem of Allen Bradford (BRAD) and Marc Tyler (MARC). The duo combined for 16 carries and 44 yards. Kiffin has always favored the passing game, but their offensive line is stacked with five star offensive lineman and they’re not running the ball with consistent success. For the second straight week the highest wide receiver stock has moved around on the NASPAQ. Juron Criner (CRIN) took back his number one position with a 12 catch 179 yard, 1 TD performance and former #1 – Jermaine Kearse (JERM), has been battling drop like symptoms the past few weeks. True freshman Robert Woods (WOOD) had the best game of the year for Pac-12 receivers with his 12 reception 224 yard, 3 touchdown performance. Perhaps even more impressive than his numbers is that the majority of the youngster’s yards came against Stanford’s senior corner back- Richard Sherman. The Ducks Jeff Maehl (MAEL) also had a big game with ten receptions for 119 yards and a TD. Our top defensive player, Akeem Ayers (AYER) finally saw his stock take a hit with only three tackles in the loss at Cal, but the other two UCLA linebackers (Westgate & Larimore) combined for 21 tackles. The biggest defensive star in the game just happened to be on Cal’s roster as Darian Hagan (HAGN) had five tackles, two sacks, and an interception to be the conference’s defensive player of the week. Delano Howell (HOWL) at Stanford was jarring the ball out of receivers hands and forced a fumble. While the USC defense looked terrible, at least their cheerleaders destroyed the Stanford cheerleaders. If Stanford has another game on TV this year I think their coeds might crack my television set. You know how the saying goes when you face the pistol, “You shoot me once, shame on you, you shoot me twice…..” well the Bears weren’t fooled this time. After giving up nearly five hundred yards to Nevada they held UCLA to a paltry 144 total yards and only 26 yards on the ground. Mychal Kendricks was outstanding at linebacker for the Bears and he’s now tied for the most sacks in the conference with 4. In the USC vs Stanford game both teams looked like they were playing touch football in the secondary. The Trojans are athletic, but undisciplined and lack fundamentals in their tackling. 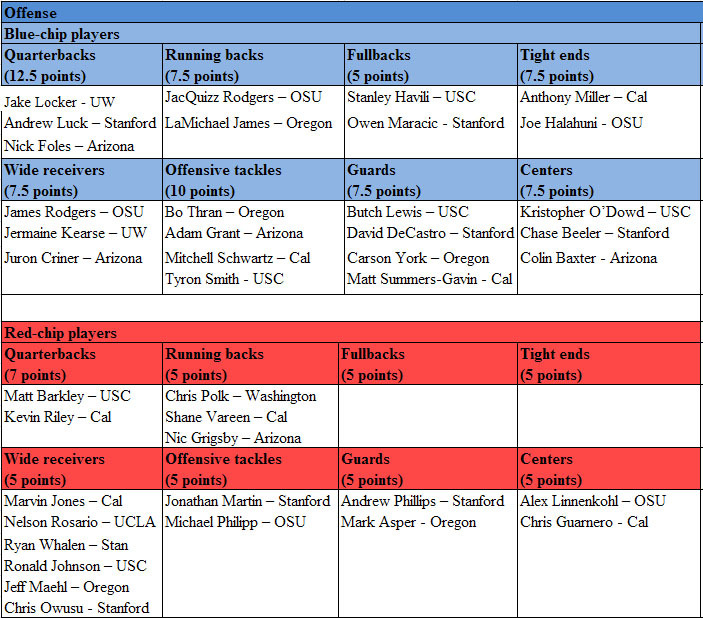 As previously discussed about Stanford, they are slow and with the exception of Delano Howell, they’re poor tacklers. Arizona State had the best defensive performance going on the road and shutting down the Husky offense. Holding Jake Locker to just 14 points at home is impressive and Vontaze Burfict seems like he got the message of cutting back on his penalties, but that could be because he played less. And although she’s not in any UCLA apparel, we need more Rachel Lorraine. The first annual Leader of the Pac All-Pac-10 team is completed, a second team will probably appear in the next couple weeks. I had a tough time picking a quarterback for the first team, because I think Andrew Luck, Matt Barkley, and Nick Foles actually have better mechanics and accuracy than Locker and two of their teams (USC and Arizona) I have projected to have a better season than Washington. The deciding factor for me was Steve Sarkisian’s ability to put Locker in the right situation and the improvement that comes along with having the same person calling the plays in consecutive years. Wide receiver was also a tough position to pick and leaving James Rodgers off the list was the hardest part of the team, but I think his numbers will drop significantly this year. If I make a second team list, that’s where I would put him along with Ronald Johnson. The offensive line was tough for me, because as badly as I wanted to put some Stanford guys on the list I think they’re going to have a much tougher time protecting the QB this year. They would have multiple second team guys on my list. For the defensive line I almost went with Arizona’s Ricky Elmore, but I think he’ll have a tougher time with Arizona losing their defensive tackles from last season. At linebacker I wanted to put Akeem Ayers on the team, but with the loss of Brian Price and Reggie Carter I’m expecting him to be the guy that offenses plan around. I think Mason Foster and the Husky defense will have a hard time getting off the field, so look for his tackles to increase this year. This is a rather weak year for secondary players in the Pac-10, at least when it comes to name recognition, but Rahim Moore is on every All-American list and leads the pac. There are better cover guys than John Boyett, but he’s a tackling machine and ended up with 90 last year. After almost a week without a new post, I have finally completed the conference predictions. I didn’t include the newest members of the conference, and didn’t account for them in the rankings for each unit that you’ll see at the end of each team. I looked at every team’s schedule and posted which games that I predict them to lose. I ranked the offenses, defenses, and schedules of the teams to determine how they will finish the season. The schedule rankings were more heavily weighted towards conference schedules, but Oregon St took a big drop because their non-conference schedule includes two top five teams. The Trojans don’t have the explosive offense or dominant defense of their ’04 or ’05 teams, but they still have the deepest roster in the conference to go along with a favorable schedule. They get Oregon at home and they face Oregon St much later in the season (week 11) than the last two times they traveled to Corvallis. I’m projecting their game with the Beavers to be a loss, because the Trojans haven’t won there since 2004. The next most difficult match up will be against Arizona on the road. The Wildcats beat USC last year in LA, and the spread offense will give the Trojans young secondary a problem. Washington and Stanford could also pose a problem with strong QB play. The loss of Jeremiah Masoli will really hurt this team offensively, which in turn will hurt them defensively. There were many times when Masoli extended plays with his legs and picked up first downs for Oregon, most notably in the Civil War on a 4th and 6 to keep the ball away from Oregon St and clinch the game. Masoli’s 668 yards rushing ranked second on the team and his threat of running the ball created opportunities in the spread-option offense for LaMichael James. 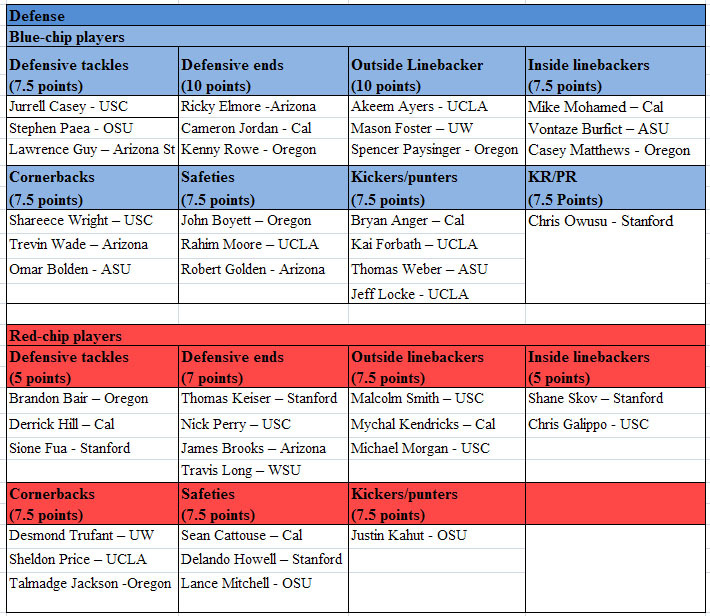 Oregon will not have that luxury with Nate Costa, but he might be a better passer than Masoli who was average at best. If Oregon is going to compete for the Pac-12 championship this year it will need to have strong play from the QB position, because he’s not going to get much help from their average wide receiving corps and little depth. The running back depth will probably be better with blue-chip freshman Lache Seastrunk, but his running style is similar to LMJ. Kenny Rowe led the conference in sacks last year and he has two solid linebackers behind him in Casey Matthews and Spencer Paysinger. This is a very aggressive defense and they miss a lot of tackles because of it, which led to their free safety John Boyett leading the team in tackles last year. The problem for Oregon is that they will be facing their top 3 opponents on the road this year in USC, OSU, and Cal where Jeff Tedford has never lost to Oregon at home. Nick Foles and Juron Criner will form one of the top QB-WR tandems in the conference, but the Wildcats depth at WR took a hit when Deleshaun Dean violated the team’s gun policy and felt he needed to protect his pancakes at all costs. Arizona will face a tough test when Iowa travels to Tuscon in week three of the season. The strength of the Arizona defense will be at defensive end, but their lack of experience at defensive tackle and linebacker could create problems for the Arizona secondary. Arizona was a descent road team last year beating OSU & USC, but they should have beaten Washington and were in a position to beat Cal if it weren’t for two once-in-a-lifetime plays (videos linked). I see them struggling against Stanford and Washington if they’re not able to pressure their QB’s. A lack of defensive experience is going to be the Achilles heel of this team in 2010. The Golden Bears were Pac-10 champions in 2006, but this team has been an enigma ever since. Jeff Tedford was supposed to be one of the premier quarterback coaches in the nation, but four years into the Kevin Riley project has the guru still searching for answers. The Bears had significant turnover in their coaching staff this off-season losing their Defensive Coordinator Bob Gregory and letting go of Special Teams Coach Pete Alamar. Despite the lack of consistency at QB, and an offensive line that gave up 31 sacks a year ago, the Bears have some weapons at their disposal. Mike Mohamed led the conference in tackles last year, and Cameron Jordan is one of the top defensive lineman in the conference. Cal landed the top outside linebacker recruit of 2010 in Chris Martin and he’s expected to be the weapon off the edge that they’ve lacked since Zack Follett’s departure to the NFL. Shane Vareen quietly had a productive 950 yards and 12 TD’s a year ago, but look for his numbers to go up as he’s slated to be the starter all season. Mel Kiper has ranked Anthony Milleras the number one tight end in the country among juniors and Marvin Jones was Kevin Riley’s favorite target a year ago at WR. The Bears get Oregon and Washington at home, but they have to travel to travel to USC, Arizona, and Oregon St.
For six consecutive years the Beavers have lost at least 2 of their first four games and 2010 won’t be any different when they face Boise St and TCU in the first three weeks of the season. The Beavers have the top two play makers in the conference in the Rodgers brothers, but there will be a significant drop-off at QB after losing first team All-Pac 10 member Sean Canfield. I’m expecting Jacquizz to see more carries at running back, but teams will be looking to stack the line against the Beavers to beat them with the pass. Although this is a great year to be breaking in a new QB with lots of unsettled secondaries in the conference, Oregon St also had trouble protecting their QB last year giving up 29 sacks. They return four starters on the offensive line, but there’s a big difference in their run and pass blocking capabilities. Inexperienced quarterbacks are more prone to turning the ball over if they are uncomfortable in the pocket, and it could be a real problem for the Beavers. They face the top two opponents in the conference in Oregon and USC at home, and even with projections of beating both of them I still see this team struggling on the road to finish with three conference losses. Jake Locker is going to be the leader of 11 returning starters on offense, but unless he can suit up on defense the Huskies are going to have a hard time winning on the road. All of the pieces are in place offensively with one of the best tandems in the country at wide receiver in Devin Aguilar & Jermaine Kearse, a solid tight end in Kavario Middleton, and a capable weapon at running back in Chris Polk – all protected by an offensive line that accounts for 88 career starts. As good as the offense is going to be, the defense might be as equally bad. Mason Foster has great instincts at LB which led to 3 interceptions, six 6 forced fumbles, and a fumble recovery in 2009, but other than that the cupboard is sparse in terms of depth and talent. Even worse for the Huskies is their brutal road schedule that includes trips to the better team in every region – Oregon, USC, Cal, and Arizona. They will have an opportunity to gain some hype early with a game against a preseason top 10 team Nebraska, but a loss will certainly damage their confidence going forward. Stanford’s had the second best offensive line in the nation by only giving up 8 sacks all year. Part of the reason for low sack totals has to do with the success they had running the ball (537 attempts), so they only threw 313 passes all year. That luxury is gone now that Gerhart is playing on Sundays, so I’m expecting that total to go up. The guys behind Gerhart might be quicker, but they are not going to wear down opposing defenses and Andrew Luck will be the primary weapon that defensive coordinators will try to stop. The strong offensive line will help, but I’m expecting some drop-off in the offense this year. The defense has switched to a 3-4 in the off-season, but they lack the right personnel to be good this year. They have a strong linebacker corps led by Shane Skov, but they don’t have the big defensive lineman to hold the blocks and create opportunities for them. It will take a couple years of recruiting to get the right pieces in place for this defense as their crosstown rival Cal is finding out. The Cardinal were 2nd to last in the Pac-10 defense last year giving up 402 yards per game, and it could be even worse this year without a strong running game to burn the clock. The Cardinal get USC at home, but have to play Oregon and Washington on the road. Coach Rick Neuheisel is coming off his best recruiting class since arriving in LA, but when you’re expecting freshman to make a big impact on your team, you’re in trouble. UCLA has a combined 92 career starts on the offensive line, but they gave up 28 sacks last year so the talent on the line is as big of a question mark as every other position on this team. The Bruins have two preseason All-Americans with linebacker Akeem Ayers and safety Rahim Moore, but I’m expecting their production to decrease with Brian Price going on to the NFL. Neuheisel brought in two blue-chip guys on the defensive line in Owa Odighuizuwa (try saying that five times fast) and Cameron Marsh, but it won’t be enough to take over games or compensate for their lack of offense. UCLA also faces a tough schedule with Kansas St, Texas, and Houston before they start conference play. The young guys will either gain quality experience or have their confidence shot in the process. It was only three years ago that Arizona St was competing for the conference championship, but they are 9-15 since 2007 and are riding a six game losing streak into 2010. The offensive line has been a major problem for this team in the past three years and one of the main reasons they averaged only 22.3 ppg in 2010. The Sun Devils only welcome back three starters on offense and could be even worse than last year, their defense should be salty and will be led by the All-American Vontaze Burfict at MLB. They only return four starters, but they have are solid at defensive end and have proven the ability to stop the run. The schedule has them facing the best team of every region on the road (USC, Cal, Oregon, Washington), but they weren’t likely to beat them anyway so all of their home games become winnable. I wouldn’t be surprised to see them post a winning record at home, but for now we’ve got them pegged at 3-9. The good news for Washington St is that they face the best team from every region at home (Oregon, Cal, USC, Arizona) the bad news is that they won’t be able to win any of them. The Cougars only have a couple chances to get a conference win, and it will have to be against UCLA or ASU on the road. They have two capable QB’s in Jeff Tuel or Marshall Lobbestael, and I’m expecting both of them to play this year based on the 53 sacks they gave up a year ago. This is the deepest team that Paul Wulff has fielded since he’s been here, but they are still a couple years away from making some noise in the conference.